So now it's designed and you are ready to get started. What's next? First you need to secure your construction loan from your Mortgage Lender. Of course, the Lender wants to know how much it will cost to build your home. The frame and SIPs (structural insulated panels) will be built and supplied by us and since we have the actual plans now, we will produce a fixed Construction Contract exactly defining our part of the work and its cost. You will need to submit copies of your plans to your General Contractor who will in turn present them to Subcontractors for bids. Once all of the bids are in, you will know within say 10% what the home will cost to build. The lender will most probably want an Appraiser to look at your plans to make sure the appraised home value is equal to the loan value. This can be a sticky issue and I would be happy to discuss my experiences with you. Our Construction Contracts are written specifically for each individual project and detail a specific budget for our part of the work. The contract also defines what we will be doing and when we will do it (our best guess schedule) and our mutual responsibilities during the construction process. We will review the contract with you in detail to make sure there are no misunderstandings and answer all of your questions honestly. It's pretty straight forward. Red Suspenders: We work under a fixed Construction Contract to fabricate the frame at our Nacogdoches Texas facility. We then ship the completed frame and the required SIPs to your job site. 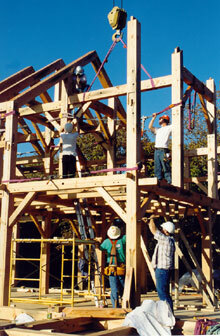 We then raise the frame on the foundation that we designed but that others have built. We coordinate the frame delivery to the site with the GC and provide the necessary experienced crew to do the raising. Once the frame is completed, we have our panel crew install the SIPs to completely enclose the home and cut all of the openings for all the doors and windows. At this point, we turn the project back to the GC for finish-out. Our contract usually covers all the material, the crew and equipment needed to raise the frame. General Contractor: is responsible for the overall scheduling of the site work and is responsible for the actual finish-out of the home. GCs usually charge a percentage of the overall budget for the home in the 10% to 15% range. A good GC is worth his weight in gold. We can help you find a good GC but please realize that we don't know of all the good ones in your area. We will work closely with your GC to answer any questions he might have and coordinate the work flow. Subcontractors: answer to the GC and do the actual work such as plumbing, HVAC, electrical and the like. They are generally paid by the GC using "draws" made from your construction budget. Subs generally work on a bid basis but depending on the company or individual, they may be reluctant to give you a fixed price. Things like HVAC are easier to pin down than say general carpentry but a good GC will work with you to control these cost and manage your construction budget. After all the contracts are signed, the next step is to start building your home. Most mortgage lenders will need your complete construction drawings and specific contracts to approve the construction financing. Red Suspenders will provide you a fixed cost Construction Contract for our part of the project. Your lender may require an appraisal of the project prior to closing your financing. Most lenders require the project to be completed before converting construction financing into a long term mortgage. Red Suspenders designs the home, builds and raises the frame and puts up the SIPs. The General Contractor builds the foundation prior to raising the frame then runs the project to completion after we finish the frame and walls. Subcontractors actually do the work under the direction of the GC. What role does Red Suspenders play after the frame is raised? Do site reviews to insure the GC is building the home according to plan. Provide select materials for flooring, walls and trim from our workshops. Provide other project consulting as required by the owner or GC.